A renowned local musician, William G. "Bill" Hill, died on April 12, 2005 at the age of 90. 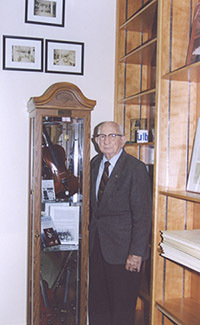 As a testimony to his life-long love of gospel and bluegrass music, he had graciously donated several of his musical instruments for a permanent display at the Bassett Historical Center prior to his death. These instruments are ones that he played and had enjoyed for so many years. William G. "Bill" Hill was born in Surry County, North Carolina and moved to Henry County in 1932. The first time he was asked to play in this area was by Pastor W. J. Yeaman at the First Baptist Church in Bassett. Bill was born into a family with strong musical ties, and all members of his family played a musical instrument. 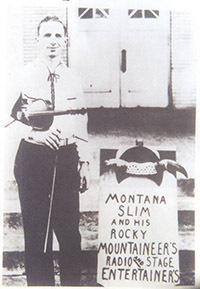 Bill and his brothers, Dewey and Sam, formed THE HILL BROTHERS and broadcast on the radio stations and recorded traditional bluegrass and ballads. He and his brother, Dewey, formed a group called the HENRY COUNTY REVELERS, along with his brothers-in-law Lancaster Turner and Curtis Turner. They enjoyed playing in churches and at dances along the North Carolina/Virginia border. In 1980 when he retired from DuPont, Bill formed BILL HILL AND THE SOUNDS OF COUNTRY. This group enjoyed sharing their music until ill health forced Bill to retire his music several years ago. On display is a full-sized VIOLA and it is really a treasure to musicians. The top is of spruce, the back and sides are made of Rock Tiger curly maple, with ebony trim. It was made around 1940 and was distributed by the Jackson Guidan Violin Company of Columbus, Ohio. The full-sized VIOLIN is a copy of the Giovan Paulo Maggini 1670 model. It has all ebony trim and was made in the 1930s. The smaller VIOLIN is called a three-quarter violin.